Two new papers on prosocial behaviour in monkeys suggest that giving to others can be self-rewarding, and also sensitive to situations. Primates are particularly social species. Not only do they frequently live in large groups, but many also behave altruistically to members of their groups. Yet the factors that drive altruism and other-regarding behaviour remain unclear. One idea is that a feeling of empathy drives prosocial behaviour: a feeling of connectedness provides the motivational fuel to help others, which is in turn rewarded with a warm glow produced by activation of reward circuits in the brain (when humans do goof they tend to feel good, and show activation of reward-related brain areas). Aside from exploring the subjective feelings produced by other-regarding actions, or the effects these have in the brain, another way to explore this empathic hypothesis is to look at how people or indeed non-human primates behave. If a systematic bias towards acting in ways that benefits others can be demonstrated, this would suggest that it is intrinsically rewarding or gratifying. Research into the altruistic tendencies of chimpanzees has thrown up a number of conflicting findings. Early studies suggested that chimpanzees are indifferent to the welfare of others. Joan Silk and colleagues reported that chimpanzees were no more likely to choose an option that benefitted themselves as well as another familiar individual at no extra cost than they were to choose an option that benefitted just themselves (1). Similar results were found by Keith Jensen and colleagues, suggesting that chimpanzees are motivated solely by personal gain (2). Later studies have complicated the picture. Chimpanzees, like young children, will help a human get hold of an object that is out of reach of the human but which the chimpanzee can move into a better position, particularly when this can be achieved with not too much effort (3 – described here). Chimpanzees will also help another chimpanzee get into a room to access food, even if the helper cannot benefit from the fruits (literally) of this act — that is, they help regardless of reward prospects (4). This suggests a motive for helping beyond concerns about personal gain, or a selfish cost/benefit analysis. In a paper published in PNAS, Frans de Waal and colleagues have looked at giving behaviour in brown capuchin monkeys (Cebus apella), to see whether there are any signs that empathy for others factors into social behaviour (5). It should be noted that these New World monkeys are much more distantly related to humans that chimpanzees, other African apes, and Old World monkeys. Nonetheless, they can provide insights in the motivational factors involved in altruistic behaviour, which may also apply to more closely related species, and indeed us. If the monkeys were indifferent to benefitting their partners, then they would be just as likely to pick the selfish option as the prosocial – they choices would look 50/50, or random (there’s little reason to suppose that they would consistently pick the selfish option, unless they were particularly nasty, and observations in the wild do not suggest this). A bias towards the prosical option would, by contrast, suggest a concern with others. And this is just what de Waal et al. found. When capuchins were paired with known but unrelated individuals, they chose the prosocial option significantly more often than chance, and the effect was even stronger when the partner was a relative. The prosocial effect only disappeared when the partner was an unknown member of a different group. In general, prosociality increased with the closeness of the relationship between subject and partner. From an empathy-based perspective, this makes sense, as we feel closer, and therefore more empathetic, towards family members, friends, acquaintances and strangers in that order. The capuchins were also more likely to look towards their partners when they were being prosocial, and to exchange more gestures of affiliation. The kindness demonstrated in these studies was also shown to have limits. In a variant of this set up, the rewards we asymmetric, such that in choosing the prosocial option generated a reward for the subject (an apple) inferior to that given to the partner (a grape – capuchins are apparently particularly fond of this fruit!). 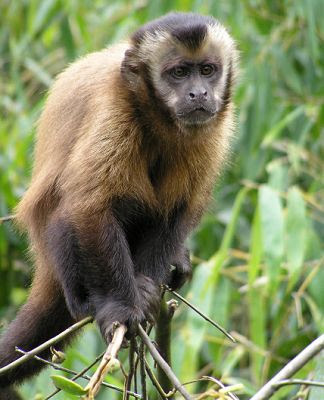 Previous studies (again using grape rewards) have shown that capuchins are sensitive to unfairness in rewards for comparable efforts, and inequity was shown to be a factor in modulating giving behaviour in the current study. Preference for the prosocial option in the face of inequity in rewards failed to exceed chance, although came closest to doing so between relatives (so although inequity made the capuchins less kind overall, they were still kinder to kin). The other paper by Jennifer Barnes and colleagues, published in Biology Letters, looked at helping from another perspective (6). These authors take the previous conflicting data on chimpanzee sociality and altruism to indicate that the cognitive operations underlying altruistic behaviour are context-dependent and sensitive to the particular details of a given situation. And it was these details they set out to explore. The team ran two experiments. In the first, a capuchin monkey sat in a room connected to a small annex; in the annex, which was separated from the main room by a grid, sat a toy that an experimenter was trying to reach (see (a) in figure). While it was beyond the grasp on the human, the monkey could reach through the grid and pass the toy to the experiment. In one condition, the experimenter held a reward in their non-grasping hand, and in another they held up an empty hand (these were also subdivided such that half the time the experimenter flapped a hand around trying to reach the toy, while at other times they just held it limply in the annex). In all cases, the experimenter stared intently at the toy, and glanced up to the monkey from time to time. These conditions didn’t make much of a difference, and very few capuchins could be bothered to extend an arm through the grid and manoeuvre the toy into a suitable position for the experimenter, reward or not and irrespective of reaching behaviour by the experimenter. In the second experiment, the set us was changed slightly: the grid separating the annex from the main room was removed, so the monkeys could easily walk into the annex to get hold of the toy (see (b) in figure). The conditions (reward/no reward, combined with reaching/no reaching behaviour) were repeated as in experiment 1. Now things were different. In these trials, which were run repeatedly, all six monkeys in the study repeatedly handed the toy to the experimenter. This provided data that enabled the effects of reaching and reward to be analysed. Regardless of whether or not the experimenter was actively trying to reach the toy (over and above staring at it, and then the monkey), a reward made the monkeys help more than 95% of the time. By contrast, when there was no reward and the experimenter tried to reach the toy, monkeys helped a little over 50% of the time (and when there was no reward and no reaching this dropped to just over 30%). These results suggest, in the words of the authors, that capuchins are “somewhat stuck on their own personal pay-offs”. In other words, capuchins seem to care more about what’s in it for them than the potential benefits their behaviour could bring someone (admittedly a human in the case). This contrasts with chimpanzees, whose helping behaviour (even when it comes to helping humans) seems to be based more on the desires and needs of their partner. Barnes et al. propose that their findings point to a difference between the lineage leading to New World monkeys and that leading to the apes in the ability to incorporate the perspective of another in overcoming a self-centred bias. 2. Jensen, K., Hare, B., Call, J. & Tomasello, M. What’s in it for me? Self-regard precludes altruism and spite in chimpanzees. Proc. Royal Soc. B 273, 1013–1021 (2006). 4. Warneken, F., Hare, B., Melis, A. P., Hanus, D. & Tomasello, M. Spontaneous altruism by chimpanzees and young children. PLoS Biol 5, e184 (2007). 5. de Waal, F. B. M., Leimgruber, K. & Greenberg, A. R. Giving is self-rewarding for monkeys. Proc. Natl. Acad. Sci. USA 105, 13685–13689 (2008).